“We Come Running.” It’s no surprise the single propelled the band into the stratosphere as it seemed to be featured on every commercial and prime-time show and for good reason; it is ridiculously uplifting as it is inspiring. It’s seemingly impossible to hear it and not visualize the runner crossing the finish line, the geek getting the girl, the kicker winning the Super Bowl. 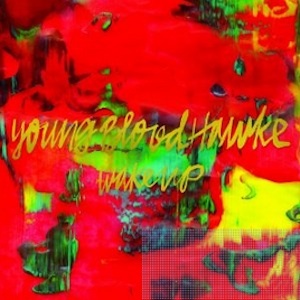 Eight months later their highly anticipated debut, Wake Up, follows suit with 13 cohesive tunes packed with raw energy that beg to be danced to at a pool party with flowing margaritas. In addition to “We Come Running” stand out tracks include “Forever,” “Rootless,” and “Dannyboy.” If you”re the well-rounded music snob that understands head bobs are a very necessary standard in music, the album’s mindless hooks will swallow you whole. But for the snob that searches for the meaning of life in everything they listen to, Wake Up, will ultimately be a disappoointment as it lacks the heavy elements to chew on. If you like Edward Sharpe And The Magnetic Zeros, Grouplove, The Mowgli’s, or Family Of The Year, we believe you will find a particular kinship with Youngblood Hawke as their music swells with heart shaped music notes we find adorably fun!